AstralPool Trichloroisocyanuric Acid Granules TCCA 90% 50kg. 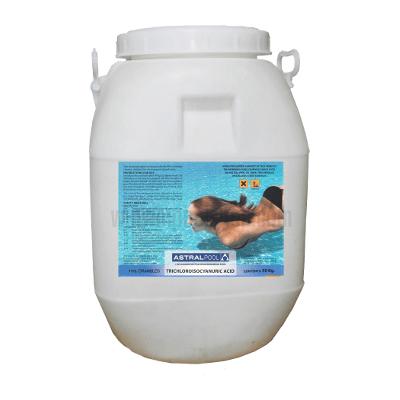 Chlorine Disinfectants & Non Comburent, slow-dissolving organic compound, stabilized, for the treatment of pool water with 90% available chlorine. According to the existing regulation, the non comburent products have a lower hazard level than the comburent chlorate products. For this reason, it does not have any storage limitations.